When winter is around the corner, darkness follows not far behind. In that time, you’re going to need something to keep you alight. There are lots of different ways to achieve this desired result – right from lighting a bonfire to streetlights. But in our books, the cheapest, most practical way is a flashlight. For that reason, we compiled a list of the best rechargeable flashlights we could find in the market, currently all below the $100 mark. 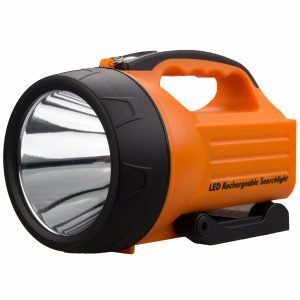 They have been picked from different categories of flashlights, including tactical, emergency and flashlights to get you ready for any situation. 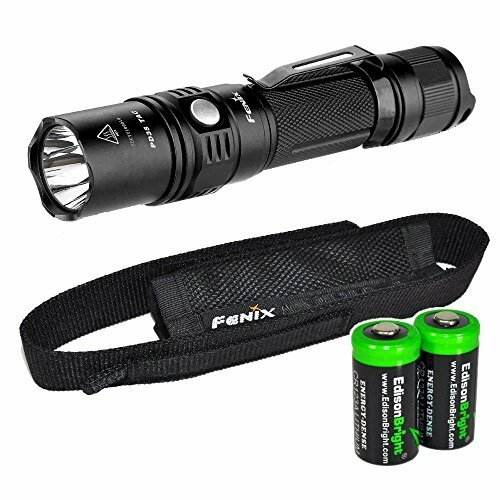 Getting down to the chase, the best rechargeable flashlight overall was the Fenix PD35 Tactical Flashlight, coming out as the best performer in virtually every field. It outshined all its competition, is waterproof and features a tough, rust-proof aluminum construction with six operating modes. It’s near impossible to beat. The Fenix may be the toughest contender on the list, but the Stanley Max is a few lumens brighter if you ever put it to the test. It comes with a somewhat ugly yellow and black frame, but aesthetic is little to give up at the face of tremendous performance. It also comes with a foldable stand that makes it easy to prop, all the while keeping your hands free while you work. The third contender, Ivation Emergency Power Failure Automatic Blackout Light, isn’t a low performer overall, but it just doesn’t cut the cheese as compared to the first two entries here. It deserves an honorable mention for a breath of relief in terms of design from the Stanley Max, in combination with dual functionality as a flash and night light. Its plastic build may pale in comparison you’re what you’re used to in terms of tactical flashlights, but it’s a joy to have around. Besides, it wasn’t exactly meant to be used in the workshop or for getting your way through a dark forest (should you find yourself there), but is pretty great to have as a fallback at home. Regardless of your profession – darkness enthusiast, construction worker, miner, or just an average consumer, you can’t deny how useful flashlights are for everyone. You never know when the next blackout will strike, but with an emergency LED light at hand, you never have to spend another minute in the darkness again. All the entries on this list use LED bulbs. But that’s a little vague for the average consumer because most people don’t bother to do the research. All in all, what is LED technology and why is it so beneficial? Before LED were incandescent light bulbs, the same iteration designed by Nikola Tesla and later improved upon by Edison and numerous other inventors of the time. The problem with these kinds of bulbs is that they rely on the filament to be heated in order to produce light, which introduces a certain kind of fragility. LEDs are different from the traditional light bulb in quite a number of ways. The most noticeable of these is that they produce light by changing the energy state electronically and very little heat is produced as a by-product. They also have a much longer lifespan – averagely 11 continuous years of use. Energy-wise, they consume a lot less battery power as compared to what was used in the old days, and they come with clear epoxy to make them shockproof. This means you can accidentally drop them without having to worry about the cost of a replacement bulb. The last area they really triumph is that they produce white light, similar to sunlight, which is far better than heat-generated light. The emergence and spread of LED lights were revolutionary for the flashlight industry. They facilitated the flashlight’s smaller form, longer lifespan and introduced a world of far lower energy consumption. Modern flashlights are more dependable, cheaper and better performing than older technology could possibly ever achieve. If you’re into Hollywood, you probably already have an idea what tactical lights are. ‘Tactical’ implies a device is military-grade or otherwise more useful in the hands of a professional rather than an average consumer. The best example, perhaps, would be our top pick, the Fenix PD35. You may have already guessed, but tactical flashlights were designed primarily for military and law enforcement use alongside a handheld weapon. Other times, they’re mounted on top of guns. They’re preferred over conventional flashlights because they’re brighter and generally better built using aluminum alloys. Tactical flashlights also have better-textured grips and an anti-roll profile, normally being compact enough to fit in the pocket. The few great tactical lights out there have made a great name for the rest and it’s now easy to spot one in the hands of even the average use. Searchlights are like tactical lights because technically they are, but on a grander scale. Historically, they were used to illuminate distant places in order to help the military detect ships detect enemies from afar and for defense against ambushes in the night time. The searchlights included on this list are far less dramatic but are designed for much the same purposes – to illuminate distant objects/positions. 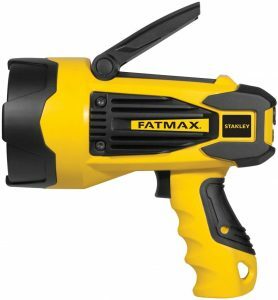 A great example would be the Stanley Fatmax. It’s yellow and black body is meant primarily for visibility purposes. They generally have a larger frame and a more grippy handle for use in the tightest spots. If you live in a remote area and want to be on the lookout for, say, hyenas, the bright light produced by searchlights is just the thing you need. So long as you don’t mind the extra bulk, these are also the best option for outdoor hobbies and for when you’re in a search party. Emergency lights, if you believe the commercials, are meant to be reliable, easy-to-find lights to be used primarily in case of an emergency. Any light can be used in case of an emergency, sure, but emergency lights are made with dire situations in mind. They use less durable materials to make them lighter and are generally plugged into a socket where they can be found easily. In case of an emergency, finding one should take barely any effort at all, as compared to having to rush to the garage drawer to search for it. A good example would be the Ivation, which can also function as a nightlight. There are generally two types of battery formats – removable and non-removable batteries. Tactical lights are usually designed with flexibility in mind, and so most good models have removable batteries. Searchlights and emergency lights, on the other hand, usually feature internal battery systems. Removable batteries can be replaced, which is convenient if the area you are has no electricity, can have additional batteries to use while you charge the others and can also use non-rechargeable batteries. Non-rechargeable batteries, on the other hand, have less moving parts. So they’re easier to maintain, charge faster and have a battery designed specifically for the flashlight, so they will last longer. In fact, while on the topic of battery life, it should be mentioned that battery life and range will be of different importance among people. However, every entry on this list has the technology to preserve battery life, achieved through settings such as different brightness modes. Depending on how much you use the flashlight, it could mark the difference between one or seven hours of usage. Most flashlights that fall within a certain category set usually feature more or less the same battery technology. Tactical lights, for instance, normally feature 18650 batteries that will last about an hour, maybe three if you’re willing to cough out a little more cash on the highest setting before starting to gradually dim. Since most users don’t use lights on maximum settings, to begin with, the average user should be able to squeeze in three to six extra hours before the light slips into an unusable threshold. Another two hours and most flashlights will peter out beyond reasonable use. This kind of battery takes an average of five hours to charge, which is pretty slow when compared to, say, charging a phone like you’re probably used to. For this kind of application, you have to plan far ahead so you’re not left in the dark. Most modern flashlights have low brightness settings to help the battery last longer, though. When it’s all said and done, you should avoid using a searchlight in the maximum setting because it introduces a new factor to be on the lookout for. Washing an area with bright light tends to wash out colors, so it will be harder to distinguish in such conditions. The batteries that normally come shipped with most rechargeable batteries normally aren’t the best you can find on the market. Most companies don’t build every component on their own either because they can’t afford to or other more established companies already can. For this reason, if you’re planning on using a rechargeable battery in a professional setting, it’s a good idea to pick up third party batteries and an extra charger. This should help you bleed out the flashlight to maximum performance and increase the run time by a few several hours, at least. Most cheaper-tier batteries also don’t include protector chips, which help keep the battery from overcharging or discharging too fast. Non-removable battery flashlights are generally more predictable. Since there’s no way to change what it comes with, you’re stuck with a single option. On the flip side, non-removable batteries make charging more easily accessible since all that’s needed is to plug in the unit into a wall socket and the rest is physics doing its thing. The Fenix PD35 comes at the top thanks to a combination of flawless design and even better performance. Note, however, that when it comes to flashlights, ‘performance’ is an aggregate of a variety of factors, not just brightness. These include battery life and the light size. 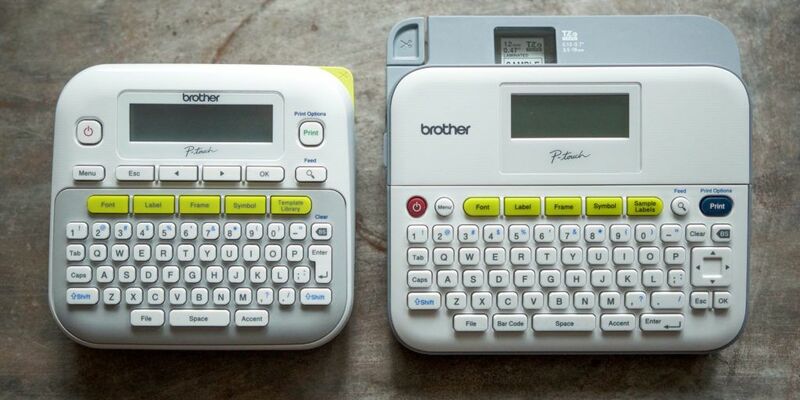 It even has a dedicated button for switching modes on its size and an overall small and easy-to-manage body. Most importantly, just the right amount and quality of light make it the perfect catch for a rechargeable flashlight. It features a slim, sleek cylindrical frame and somewhat resembles a cigar if you look close enough. The barrel is generally lean and straight. Which makes it easier to hold and slip into your pocket without having to endure that awkward bulge. It’s not completely cylindrical, though. It has an anti-roll design which makes it easier to handle around surfaces that aren’t flat as compared to competitors. The same body is also designed in such a way that there’s no wasted space inside the body, which would otherwise give it extra bulk. 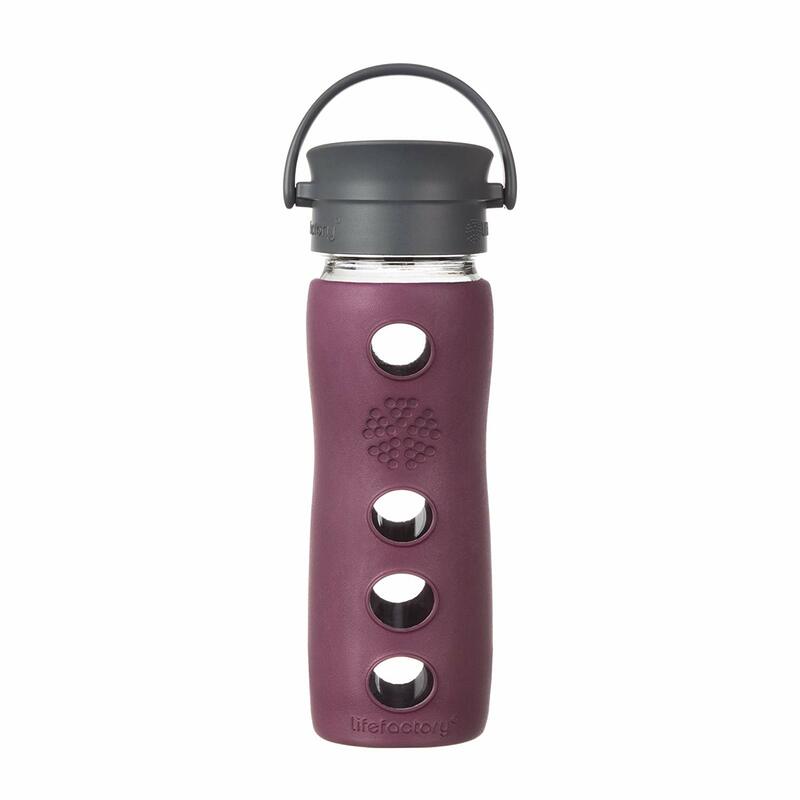 The Fenix’s body is made from a strong aluminum alloy, which is both durable and scratch resistant. It also adds a touch of shock-absorption so it can withstand a few drops and bumps without suffering any real damage. Additionally, it’s waterproof to an IPX-8 standard, meaning it can stay underwater at a depth of 7 feet for up to around thirty minutes. The strongest quality possessed by the Fenix PD35, despite its already established glorious body is the quality of light. It casts a very bright, wide light with an extremely gradual brightness drop-off from the center of the point of illumination. Most times, this is much more convenient than the zoom feature that comes with this and many other models. Even though it wasn’t the brightness performer in this area when its light is still sufficient to serve the average consumer sufficiently. The stainless steel switch at its side was another design cue that wasn’t exactly necessary but was definitely a thoughtful addition. Most flashlights rely on a tail switch to turn the device on and off between the different modes they come with. However, this is disadvantageous because the most useful designs are the ones that are easiest to use. In order to access these different modes from the tail switch, you’d have to half press it then lock it in place. You have to make sure the button engages all the way until it clicks in place. This kind of separation between the power mode and the mode switches removes altogether the need for a half and full button press. In order to switch between outdoor and tactical mode, all you have to do is hold the button for three seconds. The outdoor mode has six light settings, ranging from high to economy and strobe mode. Tactical mode is the simplest to operate since it simplifies the light into low, strobe and high modes to provide easy access between them. Despite this overall positive feel the Fenix has, it does come with some flaws that are worth pointing out. First of all, if you leave the flashlight running on maximum setting for a few minutes, it will feel warm. Give it about five more and it will be so hot you’ll barely be able to hold it. The Stanley takes the crown when it comes to the brightest flashlight of all the entries on this list, maxing out at 110,000 lux at a distance of three feet. 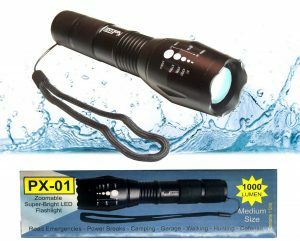 This flashlight is both rechargeable and comes with a large reflector and a bright LED light for illuminating distance areas. The fold-able stand on top of the light is a nice addition. Because it can be pushed out to support the light if it’s to be propped upside down against any surface. You’d think with such intensity, the Fatmax would drain in a minute or two, but surprisingly not. On maximum brightness, it can cough out for about an hour and seven on the lowest setting. Another nice addition is an auto shut-off feature at the hour mark for battery conservation, allowing the user to leave it on the highest setting for just several seconds. This is something of a safety feature. If you want a continuous light, you’ll have to switch over to a lower setting. 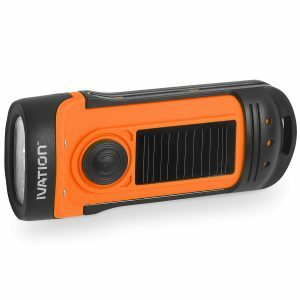 The lithium-ion battery it comes with allows the flashlight to retain a full charge for up to 12 months without having to recharge it, just in case you don’t need to use it in a while. The AC/DC cords that come with every purchase serve to facilitate a completely hassle-free charging experience. 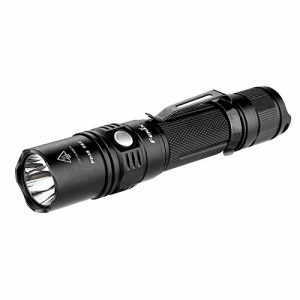 Unlike tactical rechargeable flashlights, you don’t have to disassemble and reassemble any pieces in order to charge it. If you’d prefer, it’s also perfectly fine to plug it in and let the light flood the area continuously. If you’ve owned a searchlight before, you will likely notice that the Stanley Fatmax has digressed from the usual top-side handle and opted for a pistol grip and trigger-type instead. Breaking away from the norm isn’t always the best idea. And much the same principle applies when it comes to the Stanley. This would be perfectly fine if you had a space laser blaster at hand. But it was otherwise an arguably terrible design choice, in terms of comfort. The grip is relatively easy to hold. But in terms of ergonomics, it just isn’t practical to hold such a large device away from your body over a long period of time. If you have a mounted flashlight, you can carry this at your side instead. This would make walking around more comfortable. However, it still presents the benefit of a pistol grip. Which in turn gives the ability to easily maneuver the light in the direction it’s needed. If you’re in need for an really bright light source with close to no reasonable compromises in terms of performance, the Stanley Fatmax is definitely the best option for you. It has a piercing, bright light that will cut its way through even the thickest of darkness. In fact, it can also travel far further than the rest. It also features a rugged, bold design. 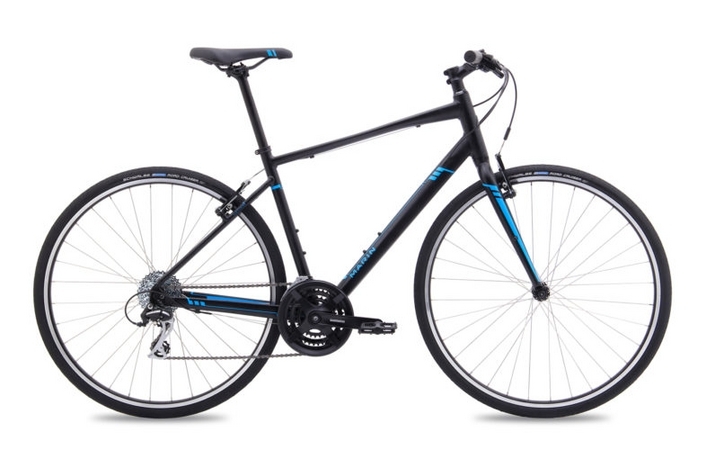 Which makes it a great option for even the most intense of outdoor activities. Even though it’s not exactly innovative in the very sense of the word,t does add some extra functionality to the more traditional designs. It’s a perfectly high-performing model that outshines most other models out there. In terms of ingenuity, the Ivation emergency light is the clear winner of all the entries on this list. At its core, it was designed to be a night light that’s plugged into the wall to work. When unplugged from the induction charging cradle, the end that was meant to be a night light turns itself off. While the other end now becomes a flashlight. The design was quite clever, in our books. It’s not the most revolutionary thing you’ll ever come across. But the production team definitely had the practicality and functionality aspects nailed down. The body is made mostly from plastic with a glossed up finish and rounded edges. That gives it a comfy, homely feel while in the palm of your hand. It’s ergonomic, sure. 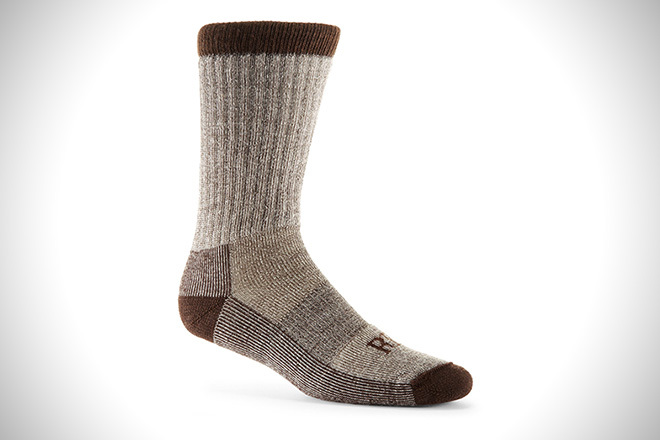 But it gives up the crucial aspect of build quality in order to achieve its levels of comfort. In its defense, though, it wasn’t made for the great outdoors. So it won’t do so well bouncing against rocks or rolling in the dirt. The light can be changed between three different settings. Each of different brightness and similar battery consumption, just like the other models before it. However, the differences between the three settings are hardly existent. They are so subtle you’ll end up flicking it to maximum setting just to get it over with. Lastly, the light isn’t so bright, so this isn’t the best thing to carry while in a search party. For use indoors, though, it should be perfectly fine. Due to subtle differences in the production process and similar dissimilarities in how houses are constructed, your model might be top heavy. An immediate consequence of this is that when placed in the charging cradle against the wall. Thus, it might lean ever so slightly forward. Over time, it will be visibly bent but should not lead to a direct compromise in terms of performance. If you really want to get the most out of your Ivation Emergency Light, make sure you utilize the night light feature in your bedrooms and hallways. What’s more, the cradle is a pretty convenient way to store your emergency light. So you always know where it is whenever you need it. 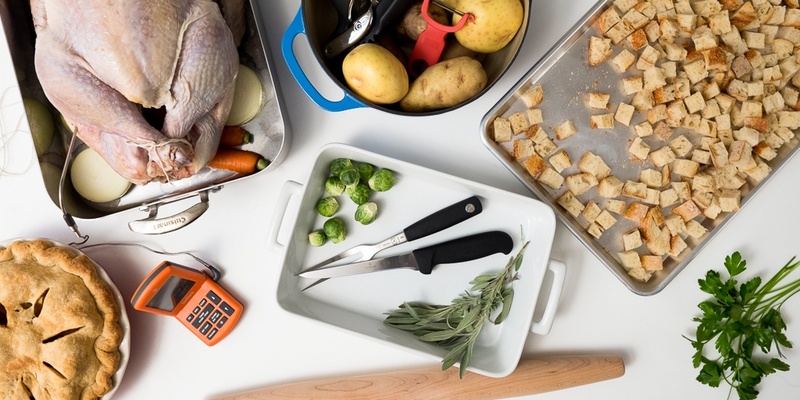 THe WASING has been a go-to favorite for many consumers for a while now. It comes with a large reflector, husky body and a handle mounted at the top. If you prefer, there is an optional shoulder strap you could get. This would come in handy when you’re tired of hauling it around. As well as, if want to loop it on a branch or your shoulder. It has a two-prong charging cable attached to the body that can be tucked inside the frame. This is ideal for both safe storage and better flexibility in terms of movement. Every purchase also comes with a flexible, foldable strip of LED lights that you can use with the floodlight option. This mode comes with a top-notch performance in terms of brightness and comes second only to the Stanley. The two models are fairly similar in terms of lighting profiles. But the brightness in the latter model drops off far more noticeably outside the circle’s center. The other area it fell short was in terms of build quality. Both models are made of plastic, but the Stanley has a better, glossier finish than the WASING. This led to a consequential decrease in weight in the WASING. This makes it feel more like a toy rather than something practical for professional use. Most importantly, it all comes down to your personal preference. 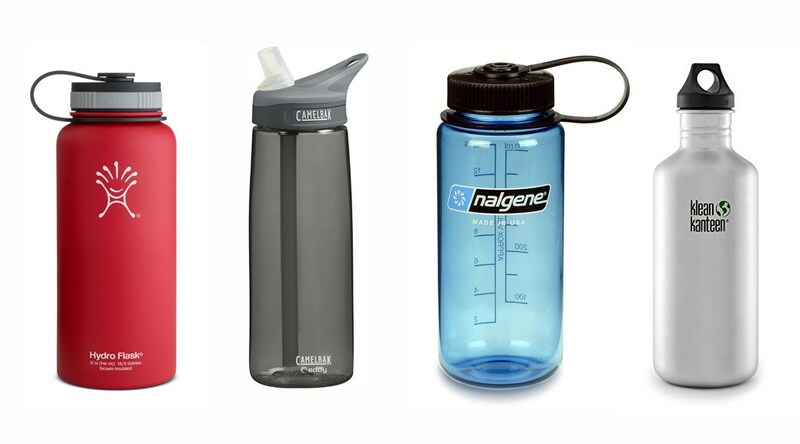 The WASING isn’t the brightest, most compact or even the highest product on the market. 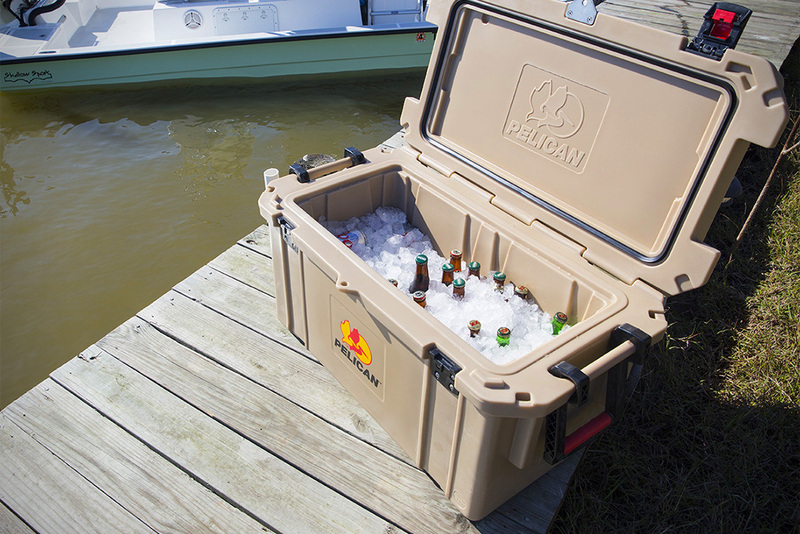 But it still makes a fine companion for most outdoor activities. Perhaps the most useful add-ons on this model that others could take a bite out of are the foldable strip of LEDs on the foldable stand the attached charging wires. These features make this rechargeable flashlight worth considering. 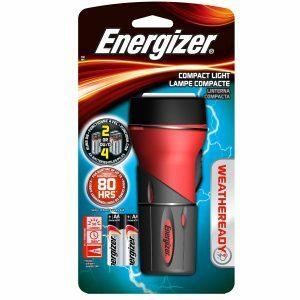 The Energizer Weatheready makes it onto the list as the cheapest and most compact entry on the list. It was designed to automatically turn itself on when the power goes out. It has photosensors on its sides. The photosensors help in determining how dark it is out and decides the appropriate measures to take afterward. The frame is designed from mostly plastic. It has also retractable prongs that you can pull out to give you a better grip while you use it. Sadly enough, but perhaps not so surprisingly, this flashlight has a low light output in terms of volume and quality. So it’s not the best thing we could recommend. This flashlight would perhaps serve as a perfect backup model rather than something you’d carry with you while camping. However, it’s a pretty cheap catch and will readily answer you call during an emergency. Aside from the Fenix PD35, there were four other flashlights that were somewhat close contenders but couldn’t make the list. The OxyLED, Refun, PeakPlus and Outlite all share pretty much the same design paradigms. Each one of them uses the same manufacturer parts, down to the bulb and the metal components look pretty similar. The only way to tell any difference between them is hardly discernible differences in dimensions. This is also reflected when it comes down to build quality. 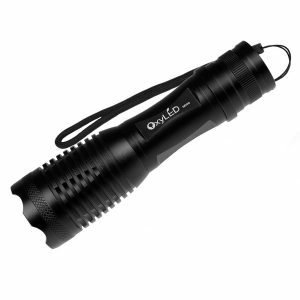 The aircraft aluminum frame is now a standard for tactical flashlights, the same material used in the OxyLED tactical flashlight. Using this device is pretty satisfactory because of how responsive it is. Every click on the switch is snappy and halfway switches are pretty accurate. Even the mechanics used to zoom retract with great responsiveness and a smooth resistance. Even so, the real contrast between them comes down to performance. The placement, shape, and color of the reflector, for one, was different in every model. Which led to a great difference in performance. Of all the four models, the OxyLED is the most impressive. Particularly, when it comes to brightness and the overall natural feel while using it. The rest had cooler tones to their light. Which only becomes apparent when shining against white objects, but has lots of implications in real-life applications. They are both unnatural and undesirable since they make it harder to distinguish what’s being illuminated. The OxyLED is pretty similar to the Fenix PD35 in many aspects. But the main difference comes along in the fact that the Fenix achieves a far higher brightness level of all the zoom modes in the OxyLED. The Fenix also comes with many more settings. Which reflects a higher level of flexibility as compared to this direct competitor. If the picks that came on this list worried you primarily because of their size, perhaps the J5 will come as a breath of relief. This is the smallest and lightest entry on the list. It’s even smaller than the Weatheready and almost 2 inches shorter than the Fenix. Although it’s so dim it barely qualifies as a tactical flashlight. It’s much brighter than the average light you’re probably used to. 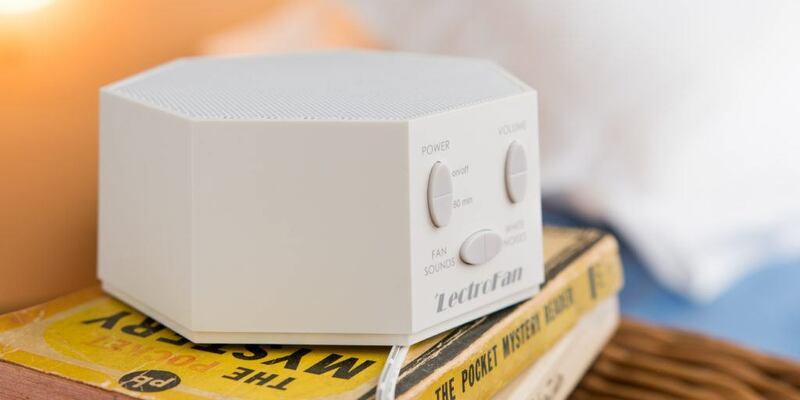 It’s still perfectly usable in most scenarios, though, since its build quality is satisfactory and durable, despite its petite size. The best part about it all is that it’s powered by the most easy-to-access type of batteries – AA. In the end, flashlights are all designed with a similar goal in mind. And will likely achieve that goal regardless of what you choose. Each model on this list has a different design strategy in mind. Furthermore, each of them serves to solve the same problem in somewhat different approaches. Tactical lights come with the advantage of an impossible-to-supersede reputation and a rugged, compact build. Searchlights are perfect for ultimate power and brightness together with hands-free usage. Emergency lights are primarily meant to be convenient whenever you’re caught off guard. The PD35 came first for its incredible build, great quality of light, practical functionality and its beautiful aesthetic. It’s a great companion for any kind of darkness.